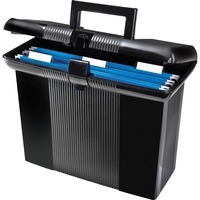 Pendaflex Portafile File Storage Box PFX41732 $14.84 Transport important documents easily with Portable File Boxes. Flip up handle stays out of way until needed. Lid protects contents when closed. Each box includes three hanging folders, tabs and blank white inserts. Durable, high impact plastic construction includes a secure latch closure.